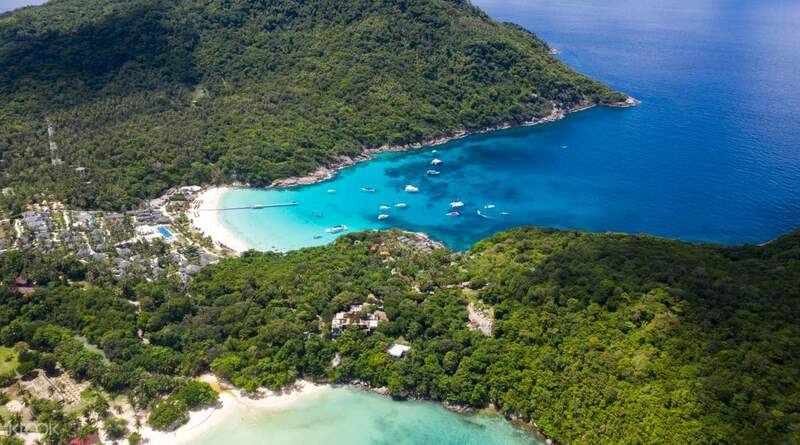 Enjoy an island hopping adventure to two of Phuket's finest islands! Enjoy a wide variety of water sports on Coral island like parasailing, diving, banana boat and more! Wonderful experience. The crew members were very friendly . The first place was Racha island, it was an amazing experience with Half an hour snorkeling in a crystal water. The next place was Coral island and again we snorkelled there for half an hour. Lunch was provided at the restaurant in Coral island which was Thai food. Nearly two hours leisure time was provided at the beach in Coral island and we thoroughly enjoyed it. Transport facility was very well arranged from klook team for pick up and drop off to hotel. Thanks to Klook team. Hit two of Phuket's most beautiful islands with this full day tour. 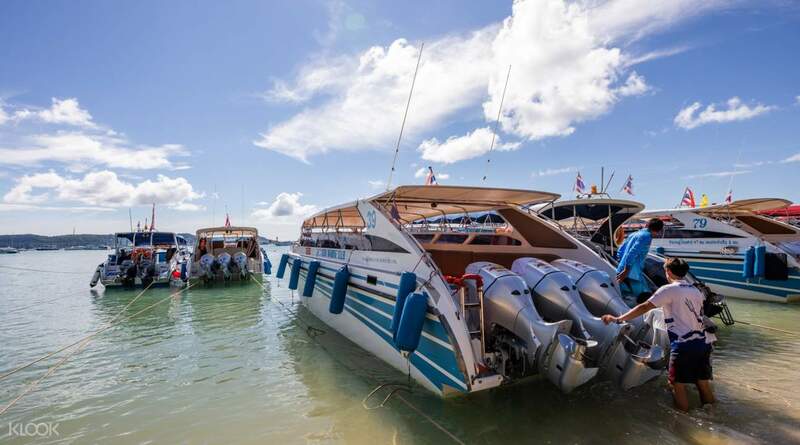 Start the day with a hotel pick up, then travel to Chalong Pier where you'll wait for the speedboat to take you to your destinations for the day. The first stop: Coral Island, one of the top snorkeling and water sports destinations in Thailand. Spend the morning there, and enjoy some free time for swimming, sunbathing and other water activities like parasailing, banana boating and scuba diving (at own cost). Afterwards, travel towards Racha (Raya) Island for the second half of your island hopping tour. Racha (Raya) Island is most notable for its crystal clear waters and is one of the best snorkeling destinations in the area. 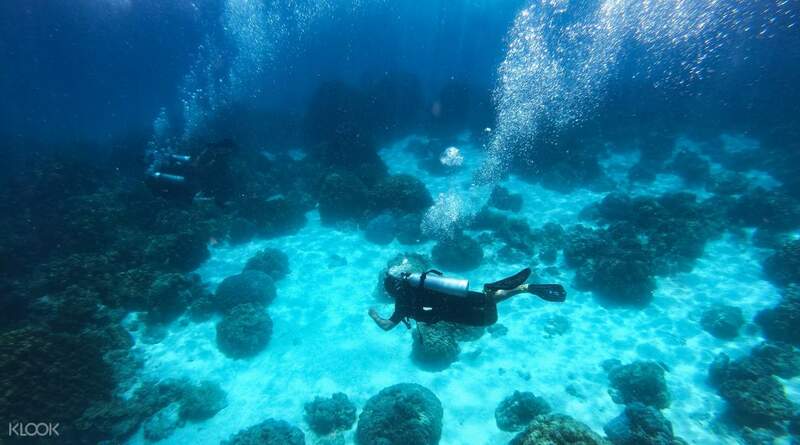 There, get to explore the island and sightsee at Lah Bay, and discover the fantastic underwater world filled with abundant corals and marine life! At noon, indulge in some delicious lunch on Racha (Raya) Island at a restaurant with an ocean view. After lunch, you have more free time to swim, snorkel or just relax. After a full day of of your exciting ocean adventure, head back to the pier and then to your hotel to enjoy the rest of your day. 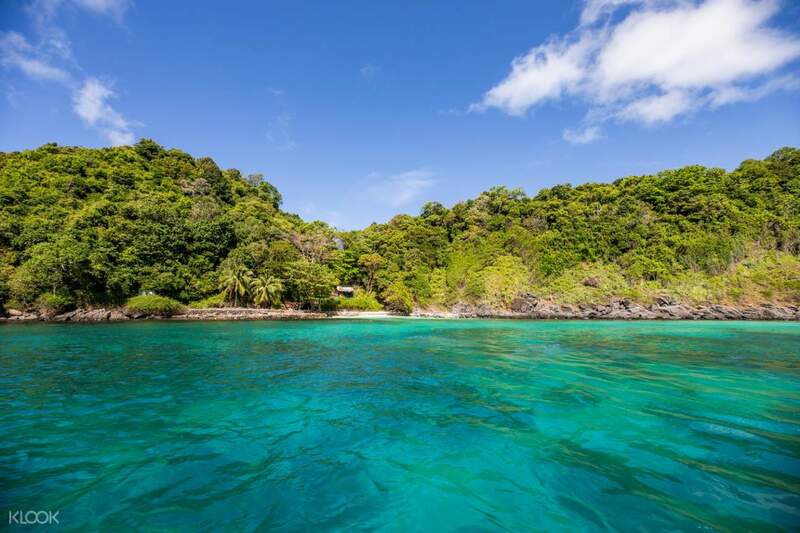 Rush along the Andaman Sea on a speedboat and arrive at your island destination in no time! Dive deep and dive well, you wouldn't want to miss an exotic encounter with seafaring creatures! It was a good experience overall, the tour guide Pau was very entertaining and confident in speaking english. The Beach was beautiful and you still can see some other fishes which is not too bad. I think it is nice to travel with family. It was a good experience overall, the tour guide Pau was very entertaining and confident in speaking english. The Beach was beautiful and you still can see some other fishes which is not too bad. I think it is nice to travel with family. Great day out. So affordable too - hotel transfers, lunch and snorkeling gear included (minus reef shoes or flippers). Staff were friendly and informative. Racha was by far the best spot for snorkeling - so clear and lots of sea life. Great day out. So affordable too - hotel transfers, lunch and snorkeling gear included (minus reef shoes or flippers). Staff were friendly and informative. Racha was by far the best spot for snorkeling - so clear and lots of sea life. Our guide Ronni was funny and speak fairly good English. The staff in the boat also was very helpful and always smiling. Helped us with the snorkelling equipments and snorkelling itself. If you’re lucky, you’ll get to snorkel with the sharks! Lunch was ok, not great. The tap water in Racha Island they gave to us tasted funny, but there’s a convenience strore there for you to buy other water. You will be stopping and resting at Racha Island for lunch and resting by the beach for almost 2 hours. It’s beautiful. I’m a first time snorkeller so i think it’s amazing and i would do it again. 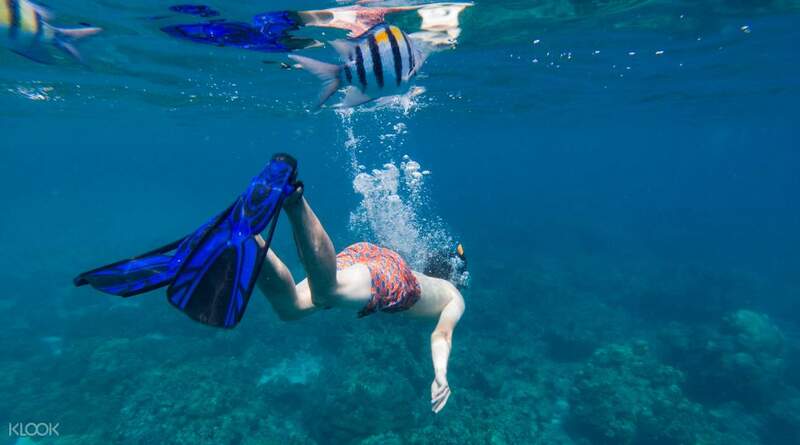 They provide the basic snorkelling equipments (snorkel gear with mouthpiece, lifejacket). They sell other snorkelling equipments at the pier before you take off on your boat, so you can always but it there. But be sure to negotiate on the price at the store before you pay. You can get a very good deal. All in all, it was a great experience and i’ll definitely try another island hopping package from Klook! Our guide Ronni was funny and speak fairly good English. The staff in the boat also was very helpful and always smiling. Helped us with the snorkelling equipments and snorkelling itself. If you’re lucky, you’ll get to snorkel with the sharks! Lunch was ok, not great. The tap water in Racha Island they gave to us tasted funny, but there’s a convenience strore there for you to buy other water. You will be stopping and resting at Racha Island for lunch and resting by the beach for almost 2 hours. It’s beautiful. I’m a first time snorkeller so i think it’s amazing and i would do it again. They provide the basic snorkelling equipments (snorkel gear with mouthpiece, lifejacket). They sell other snorkelling equipments at the pier before you take off on your boat, so you can always but it there. But be sure to negotiate on the price at the store before you pay. You can get a very good deal. All in all, it was a great experience and i’ll definitely try another island hopping package from Klook! Timely pickup by the driver and upgraded quality of service , Thanks to klook , it was the best island tour we have ever had. A light breakfast arranged at the speedboat station ,clean & hygienic toilets ,good guide , unlimited supply of water & soft drinks . We got a chance to snorkel two times (45 minutes each) - one a coral island and one just before Raya island. When we arrived Raya - there is a beautiful resort on this beautiful small island .Great Lunch on a Beach front restaurant of the resort. Then we had almost 1 & half hour leasure . Raya is a small,less crowded white sand & green clean water beach. While return guide surprised us with fruits & soft drinks again. We enjoyed every moment of this tour. Timely pickup by the driver and upgraded quality of service , Thanks to klook , it was the best island tour we have ever had. A light breakfast arranged at the speedboat station ,clean & hygienic toilets ,good guide , unlimited supply of water & soft drinks . We got a chance to snorkel two times (45 minutes each) - one a coral island and one just before Raya island. When we arrived Raya - there is a beautiful resort on this beautiful small island .Great Lunch on a Beach front restaurant of the resort. Then we had almost 1 & half hour leasure . Raya is a small,less crowded white sand & green clean water beach. While return guide surprised us with fruits & soft drinks again. We enjoyed every moment of this tour. We did a day trip to Racha & Coral Island - the weather was little hot but ok. The staff were very thorough with the guidelines & the safety to all passengers. It was a fast trip over to Coral Island only taking probably 20 minutes from the Chalong Pier. We had ample time for water sports, snorkelling & exploring the island. Lunch was to be in the Hey Restaurant. Food ok!. After lunch most of us enjoyed laying in the free sun lounges and after staying there for one and half an hour, we went for snorkelling again. It was really very clean water. Overall nice experience. We did a day trip to Racha & Coral Island - the weather was little hot but ok. The staff were very thorough with the guidelines & the safety to all passengers. It was a fast trip over to Coral Island only taking probably 20 minutes from the Chalong Pier. We had ample time for water sports, snorkelling & exploring the island. Lunch was to be in the Hey Restaurant. Food ok!. After lunch most of us enjoyed laying in the free sun lounges and after staying there for one and half an hour, we went for snorkelling again. It was really very clean water. Overall nice experience. Great experience. This is our first time using Klook to book a tour and it was hassle-free and stress free throughout. The staff were friendly and accommodating. Coral Island is a must visit (need to pay additional 100baht per person) if only just for the crystal clear waters. The speed boat trip wasn't our favourite part (sea sickness) but the rest was enjoyable. Great experience. This is our first time using Klook to book a tour and it was hassle-free and stress free throughout. The staff were friendly and accommodating. Coral Island is a must visit (need to pay additional 100baht per person) if only just for the crystal clear waters. The speed boat trip wasn't our favourite part (sea sickness) but the rest was enjoyable. Great experience for first timer at Phuket Thailand. Tour guide and team members are all kind-hearted and well known about the tour. Provide light breakfast before departing and give some fruits and water while in the speedboat. Great experience for first timer at Phuket Thailand. Tour guide and team members are all kind-hearted and well known about the tour. Provide light breakfast before departing and give some fruits and water while in the speedboat. We were picked up from the hotel in Kata Beach to Chalong Pier. While waiting for the rest to come, there were light snacks and drinks for us. I like it that the operator had a round of briefing (including safety precautions) before departure. Our tour had about 20pax and our English-speaking guide Oilie was very lively and lovely! Together with her team of 4-5 pax in the speedboat, we had an enjoyable time to Racha and Coral Island. We first went to Racha Island for snorkeling. Albeit crowded, the water was clear and we could see some corals and schools of small fishes. We then headed to the island for lunch in a halal eatery Pad Thai Restaurant which served a decent variety of food in buffet style. There were some free time for us to chill out at the beach after the meal. We then went back to the boat and as we headed over to Coral Island, optional activities eg. Parasailing, Seawalk etc were available at additional cost. 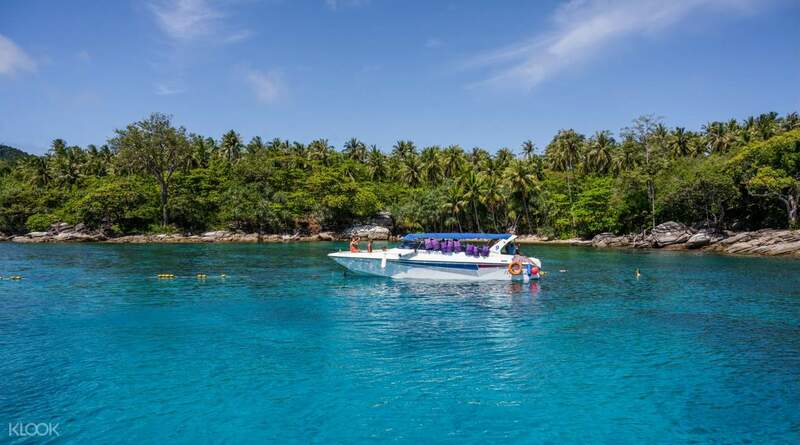 The rest could also choose to get onto Coral Island for an entrance fee of THB100 or snorkel near the island, which visibility was not as good as the first stop but lesser people had made the snorkeling session much pleasant. The tour group then reunited and we were back at the Pier before 4pm. The transport were already waiting to send us back to our respective hotels. Tipping is optional but I recommend to give generously. We were picked up from the hotel in Kata Beach to Chalong Pier. While waiting for the rest to come, there were light snacks and drinks for us. I like it that the operator had a round of briefing (including safety precautions) before departure. Our tour had about 20pax and our English-speaking guide Oilie was very lively and lovely! Together with her team of 4-5 pax in the speedboat, we had an enjoyable time to Racha and Coral Island. We first went to Racha Island for snorkeling. Albeit crowded, the water was clear and we could see some corals and schools of small fishes. We then headed to the island for lunch in a halal eatery Pad Thai Restaurant which served a decent variety of food in buffet style. There were some free time for us to chill out at the beach after the meal. We then went back to the boat and as we headed over to Coral Island, optional activities eg. Parasailing, Seawalk etc were available at additional cost. The rest could also choose to get onto Coral Island for an entrance fee of THB100 or snorkel near the island, which visibility was not as good as the first stop but lesser people had made the snorkeling session much pleasant. The tour group then reunited and we were back at the Pier before 4pm. The transport were already waiting to send us back to our respective hotels. Tipping is optional but I recommend to give generously. Pick up: On time Meeting and greeting: The guide was good at english and helpful. He greeted everyone in everyones language. Klook arranged amazing breakfast. Racha Island: Amazing, did snorkelling. Those who don’t know swimming, guide was helping with it. Got vegetable food here which was amazing. Coral Island: Its more or less commercial island. Has Parcelling, Banana ride, jet ski ride etc. got an hour or to spend on the beach. Sea Water was amazing and transparent. Klook boat has unlimited soft drinks and water. At the end of tour guide serves us watermelon and pineapple slices. Cheers to Klook and guide who made this tour fantastic. Pick up: On time Meeting and greeting: The guide was good at english and helpful. He greeted everyone in everyones language. Klook arranged amazing breakfast. Racha Island: Amazing, did snorkelling. Those who don’t know swimming, guide was helping with it. Got vegetable food here which was amazing. Coral Island: Its more or less commercial island. Has Parcelling, Banana ride, jet ski ride etc. got an hour or to spend on the beach. Sea Water was amazing and transparent. Klook boat has unlimited soft drinks and water. At the end of tour guide serves us watermelon and pineapple slices. Cheers to Klook and guide who made this tour fantastic.